We can truthfully say that we wrote the book on sustainable building practices – the Georgia Tech Yellow Book. It was created to help architects and engineers meet our strict sustainability criteria for building on campus. In recent years, all new construction and renovations have conformed to LEED (Leadership in Energy and Environmental Design) gold standards. Both our Clough Undergraduate Learning Commons – with more than 300 solar panels and spectacular rooftop garden – and the Carbon Neutral Energy Solutions Laboratory have been awarded the highest levels of sustainable building certifications and recognition. As Georgia Tech’s standards continue to evolve with available technologies and best practices, we will design and build the most efficient, effective, and responsible facilities possible. The Yellow Book provides Architecture and Engineering design standards for building technology at Georgia Tech. The link above highlights some of the design and construction standards that Georgia Tech has used. Georgia Peach, Energy Star, Leadership in Energy & Environmental Design (LEED), and Living Building Challenge are green building certification programs that recognizes best-in-class building strategies and practices. To receive certification, building projects satisfy prerequisites and earn points to achieve different levels of certification. 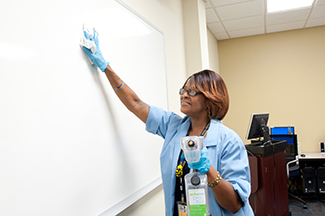 Our Green cleaning program is a method of cleaning indoor facilities that reduces water use and improves air quality. The Department of Housing at Georgia Tech is working toward LEED certifications by improving recycling, access to clean tap water, green cleaning, and much more in all the residence halls on campus. Learn more at Georgia Tech's Energy Kiosk. To learn more about Tech’s Green Cleaning Program, visit facilities.gatech.edu/green-cleaning.